We first saw this in San Juan, Batangas. We have also seen it in Candaba and Alabang. We have a video taken in Candaba of a Yellow Bittern stalking some prey. It often sits motionless, seemingly staring into the water, before it stretches out its neck to grab something whatever it was eying in the water. In Candaba, we also saw it with something sticking out of its beak. We thought it was a lizard or frog, but now think it may have just been its tongue after we saw a Cinnamon Bittern (in UP) standing around with its tongue hanging out of its beak. 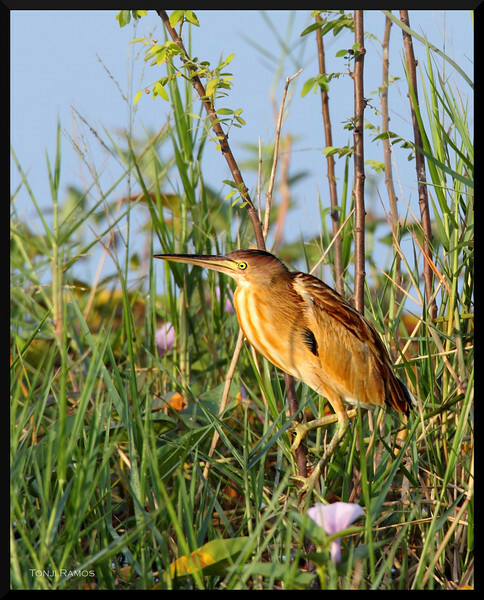 The Yellow Bittern is a resident bird. It is about 13"long. It is common in freshwater wetlands and ricefie.ds. The male has a short crest and a black nape and crown. The female has a crown streaked with black with hind neck and upper back rufous.